Dar Cherifa is now a charming literary cafe with Art Exhibitions and Cultural evenements and small restaurant. Located in the very heart of the souks, this building is a hidden secret, only found by the discerning and curious visitor, where history is recorded in the delicate tracery of the stucco and skilfully carved wood. Dar Cherifa is located in Mouassine street. Mouassine is one of the most upmarket areas of the Medina containing a number of the highest rated Riads in the whole of Morocco. You can find Dar Cherifa in a small “derb” (cul de sal, dead end) next to Bougainvillier café. (ring the bell). In the year 2000 brought Dar Cherifa back to life, and simultaneously unveiled a hidden treasure of the medina, the refined decor of this building recalling that of the Medersa Ben Youssef, jewel of the Saadian era (16th century) and one of the finest monuments of Marrakech. Renovated with the greatest care and attention to detail, with the participation of renowned craftsmen so as to maintain its authenticity and splendour, Dar Cherifa welcomes all visitors eager to meet new and interesting people. It is a real cultural venue, hosting regular exhibitions, workshops, concerts and events. This inimitable space draws one into a meditative state of mind and heart. Everyone fortunate enough to visit this building says that they breathe an atmosphere of peace and serenity the minute they cross the threshold. The mention of Moroccan culture immediately implies Moroccan cuisine, and what more beguiling setting than this pure and refined interior for sampling a cuisine abounding in cultural exchange; a subtle blend of sweet and sour, the inheritance of Berber, Jewish and Arab-Andalucian influences. Enjoy! 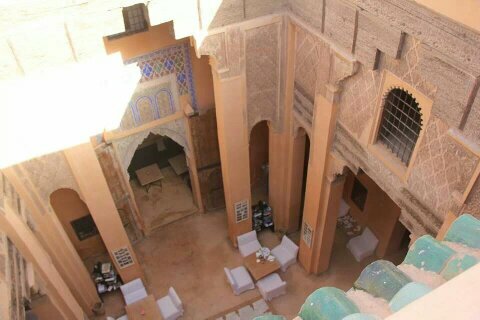 Riad Aguaviva recommend visit it.